A man was questioned by police over reports he was carrying a dead body in the boot of his car - which turned out to be dog bedding. An officer came to the home of Chris Richmond, 30, after he had visited a petrol station in Fakenham, Norfolk. As reported in the Eastern Daily Press, police had been called by a "distressed member of the public" who thought they had seen a body wrapped in a duvet. Mr Richmond said he explained the duvet was for his pet dogs when in the car. When police visited him at his home, near Well-next-the-Sea, they realised there was no body hidden in the duvet. Mr Richmond said: "The police officer did say himself it was bit of an odd call. "I'm not criticising them for doing their job. "If I was daft enough to go out with a dead body in my car in the middle of the day, they could have got a good lead." Image caption Mr Richmond said he was "annoyed" at first but can now "see the amusing side"
Mr Richmond said he had been filling cans for his strimmer and putting diesel in his Land Rover Freelander at the fuel station. He said the boot was open the whole time and another car had pulled in behind him. Mr Richmond said he was "annoyed at first" when he was questioned by police. "But I see the amusing side now that everyone else sees," he said. A spokesman for Norfolk Police said: "We were called at 13:55 BST to reports of suspicious circumstances where a member of public thought they saw body in boot of car. "A check made at the home address of the registered owner. 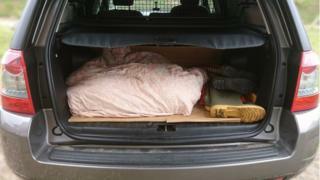 "He has shown the officer the boot of the car where a dog bed is located. No further action was taken."